Final Fantasy XV was undoubtedly one of the most anticipated game releases of 2016. Once my husband and I got our grubby little hands on it we were both filled with anticipation – but for different reasons. For him, it brought feelings of nostalgia – the last Final Fantasy game he played was FFVIII back in high school. Seeing it for the first time on a console (PS4) rather than PC gave it a whole new immersive quality. The combat scenes are definitely more exciting on a big screen. For me – I’m embarrassed to admit it was my first FF game. 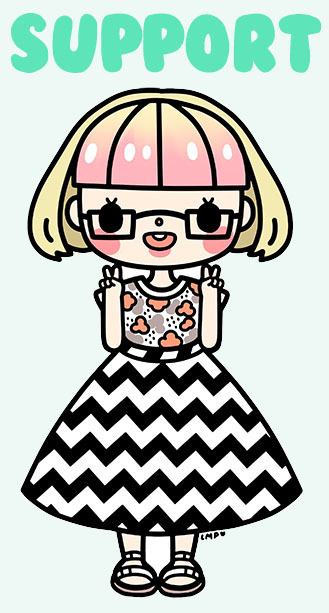 I’m more of a Sims and GTA type of girl! However, I’ve always loved beautiful environments in video games. I love exploring fantastical worlds – it’s like going on vacation without having to get off the couch. Final Fantasy XV certainly doesn’t fall short when it comes to stunning imagery. We’re only halfway through and so far we’ve been to Venice-inspired Altissa and Galdin Quay which feels to me like a resort in the Maldives. The details are delightful but I have to share one in particular which is a bit silly but has been the absolute highlight of the game for me so far. 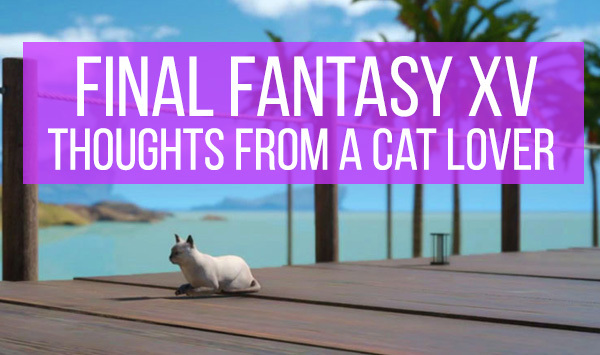 I’m talking about the two cat side quests – Kitty Catering and A Feline Feast. I told you it was silly but I get ridiculously excited when I see random cats appearing in games. When you’re playing an intentionally cute game like Ni No Kuni or Happy Home Designer, it’s not such a big deal to see an adorable animal. However, when a surprise kitty appears in a darker themed game like GTAV or The Elder Scrolls, I actually squeal and start taking screenshots. 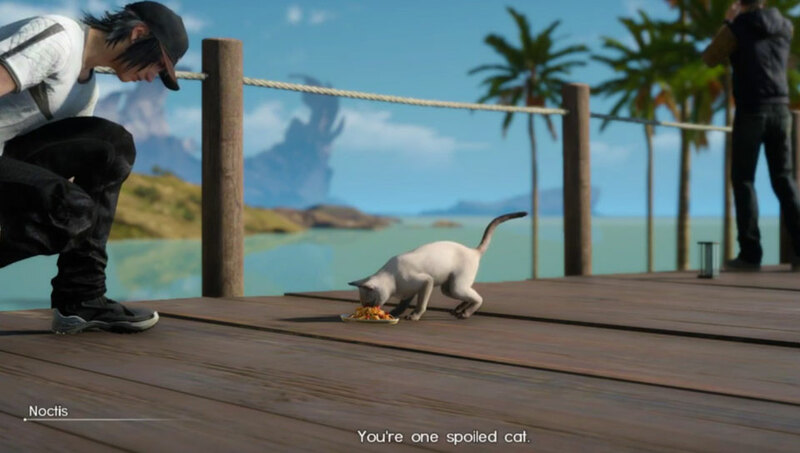 The cat in FFXV is probably my favourite in a video game so far. She looks like a slimmer version of my girl Saus (you can see my favourite pic of her at the top of this post). 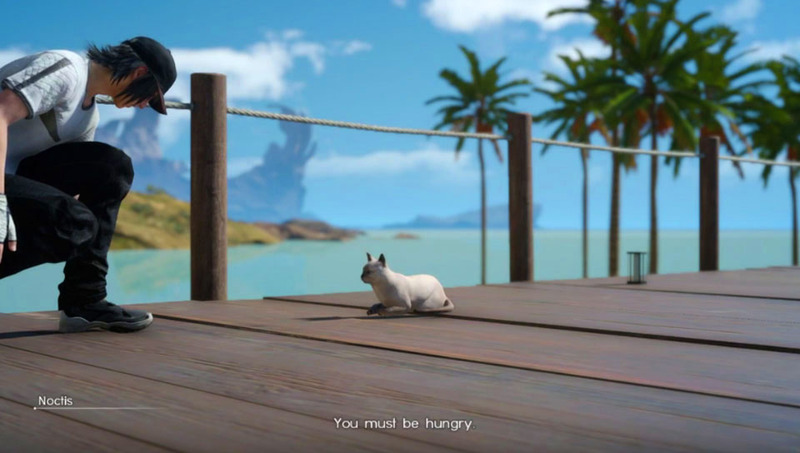 The FFXV cat remains unnamed (we’ll call her Quest Kitty) but has no trouble pulling at Noctis’s heartstrings by appearing all alone and hungry on a bridge in Galdin Quay. Much like my cat, Quest Kitty also refuses all but the finest of food (we actually give her bonito flakes as a treat). 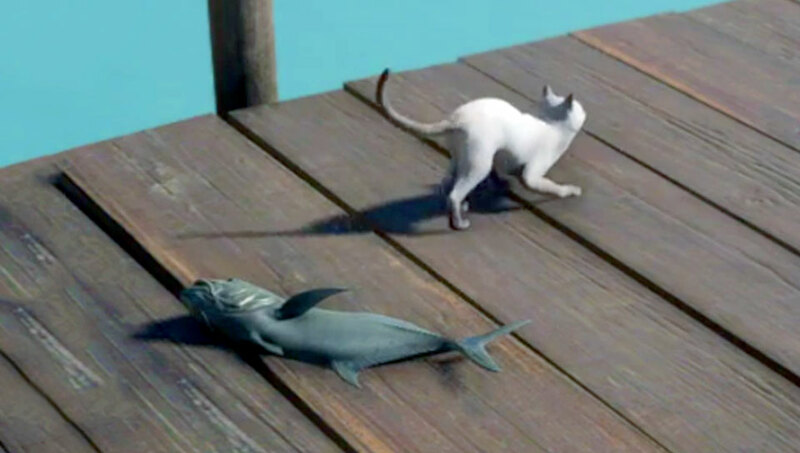 I don’t blame her – the fish Noctis offers is as big as the cat and still alive! I’m not going to spoil the quest, but let’s just say that this feline is one picky eater! Noctis goes to lengths only a true cat lover would and Quest Kitty has her hunger satiated. This doesn’t really constitute a spoiler for the game as it’s a totally unnecessary side quest. However, I daresay it’s the cutest part of FFXV – with the entire Moogle Carnival segment coming in at a close second. 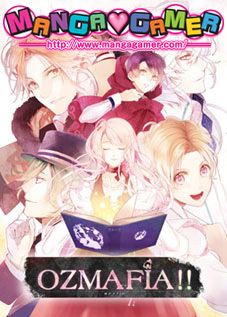 Do you know of any other games featuring unexpected cats? If so, I’d love to hear about them. Purchase Final Fantasy XV using Chic Pixel’s Amazon affiliate link to help support the site!